The book Lifehack calls "The Bible of business and personal productivity." "A completely revised and updated edition of the blockbuster bestseller from 'the personal productivity guru'"--Fast Company Since it was first published almost fifteen years ago, David Allen's Getting Things Done has become one of the most influential business books of its era, and the ultimate book on personal organization. "GTD" is now shorthand for an entire way of approaching professional and personal tasks, and has spawned an entire culture of websites, organizational tools, seminars, and offshoots. Allen has rewritten the book from start to finish, tweaking his classic text with important perspectives on the new workplace, and adding material that will make the book fresh and relevant for years to come. This new edition of Getting Things Done will be welcomed not only by its hundreds of thousands of existing fans but also by a whole new generation eager to adopt its proven principles. "I am a devout, card-carrying GTD true believer. . . . The entire approach has boosted not only my productivity but also my wider well-being. But what amazes me just as much is how deeply GTD has taken hold around the world. . . . This is a genuine movement." "I recently attended David's seminar on getting organized, and after seeing him in action I have hope. . . . David Allen's seminar was an eye-opener." "Allen drops down from high-level philosophizing to the fine details of time management. Take a minute to check this one out." 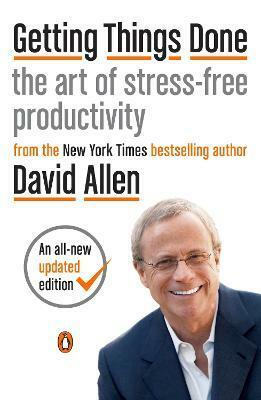 "David Allen's productivity principles are rooted in big ideas . . . but they're also eminently practical." "David Allen brings new clarity to the power of purpose, the essential nature of relaxation, and deceptively simple guidelines for getting things done. He employs extensive experience, personal stories, and his own recipe for simplicity, speed, and fun." "Anyone who reads this book can apply this knowledge and these skills in their lives for immediate results." "A true skeptic of most management fixes, I have to say David's program is a winner!" "Getting Things Done describes an incredibly practical process that can help busy people regain control of their lives. It can help you be more successful. Even more important, it can help you have a happier life!" "WARNING: Reading Getting Things Done can be hazardous to your old habits of procrastination. David Allen's approach is refreshingly simple and intuitive. He provides the systems, tools, and tips to achieve profound results." --Daniel H. Pink, author of Drive "Getting Things Done offers help building the new mental skills needed in an age of multitasking and overload." --Sue Shellenbarger, The Wall Street Journal "I recently attended David's seminar on getting organized, and after seeing him in action I have hope. . . . David Allen's seminar was an eye-opener." --Stewart Alsop, Fortune "Allen drops down from high-level philosophizing to the fine details of time management. Take a minute to check this one out." --Mark Henricks, Entrepreneur "David Allen's productivity principles are rooted in big ideas . . . but they're also eminently practical." --Keith H. Hammonds, Fast Company "David Allen brings new clarity to the power of purpose, the essential nature of relaxation, and deceptively simple guidelines for getting things done. He employs extensive experience, personal stories, and his own recipe for simplicity, speed, and fun." --Frances Hesselbein, chairman, board of governors, Leader to Leader Institute "Anyone who reads this book can apply this knowledge and these skills in their lives for immediate results." --Stephen P. Magee, chaired professor of business and economics, University of Texas at Austin "A true skeptic of most management fixes, I have to say David's program is a winner!" --Joline Godfrey, CEO, Independent Means, Inc., and author of Our Wildest Dreams "Getting Things Done describes an incredibly practical process that can help busy people regain control of their lives. It can help you be more successful. Even more important, it can help you have a happier life!" --Marshall Goldsmith, coeditor, The Leader of the Future and Coaching for Leadership "WARNING: Reading Getting Things Done can be hazardous to your old habits of procrastination. David Allen's approach is refreshingly simple and intuitive. He provides the systems, tools, and tips to achieve profound results."